Electronic Benefit Transfer (EBT) technology is currently being applied to the WIC program through a congressional mandate (in the Healthy, Hunger-Free Kids Act of 2010), which requires all WIC agencies to implement EBT by the end of 2020. As states adopt the technology, benefits will be administered through EBT, a debit card like platform, rather than the traditional paper vouchers. This transition has the potential to decrease administrative costs, streamline the distribution of WIC benefits, and reduce stigma. 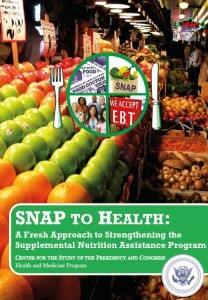 There are two EBT systems being used by various agencies: online and offline. Online cards have a magnetic stripe (write once/read many), while offline cards have a smart chip (write many/read many). There are benefits to both systems. For example, online cards can allow the user to check their benefits in real time either through an online portal or mobile app, but are more vulnerable to power outages and other problems that may lead to the online system being inaccessible. Offline cards cannot be accessed without a chip reader since the balance is only stored on the chip, but are secure against accessibility problems. Currently most states have implemented online systems, which come with a host of mobile apps such as WIC Shopper and EzWIC.